A tail between the legs doesn’t always mean a dog has hurt feelings. If you notice that your dog’s tail is unusually limp or flaccid, he or she might have a condition known as limber tail. Limber tail – also known as “cold water tail” or “broken wag”— is a condition thought to be caused by overexertion, exposure to cold weather, swimming in cold water, or excessive exercise without proper physical conditioning. Other possible causes include spending too much time in a crate (especially one that is too small) and climate changes. Common symptoms of limber tail are obvious. Your dog’s tail will be limp, and he or she will not wag it as usual. Sometimes the tail will extend a few inches from your dog’s body and then drop flaccidly. 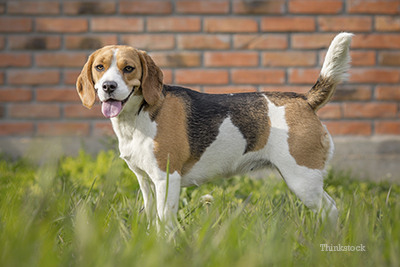 In addition, limber tail is usually accompanied by pain and swelling, especially at the base of the tail. Limber tail can usually be diagnosed by a simple physical examination. Your veterinarian may also order x-rays to rule out fractures or other injuries. Anti-inflammatory drugs recommended by your veterinarian. It is important to keep in mind that many over-the-counter drugs intended for humans are not safe for pets. In most cases, a dog’s tail will go back to normal within a relatively short amount of time. It is important to consult your veterinarian with any concerns as you monitor your dog’s recovery. Because too much physical activity can induce limber tail, it is important to gradually introduce your dog to exercise rather than pushing your dog too hard after prolonged periods of relatively low activity. It is also important to make sure that your dog’s crate is the right size and that he or she is not confined for too long. To learn more about crates and your dog, be sure to read our article on crate training. Do Dogs Experience Growing Pains? How Much Exercise is Too Much For Your Dog?